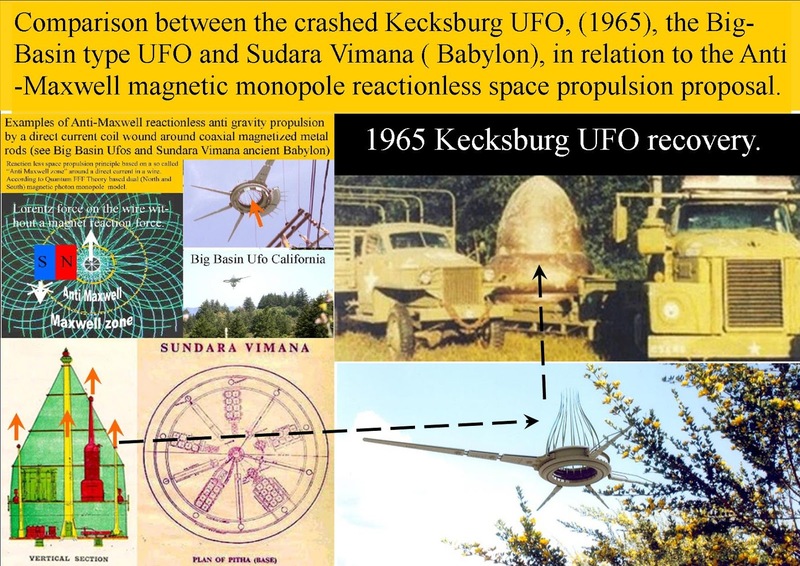 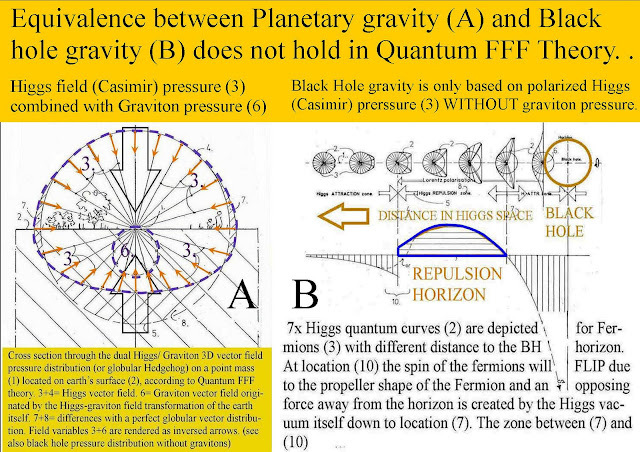 Comparison of Magnetic monopole based examples of reactionless space propulsion according to Q-FFF Theory. 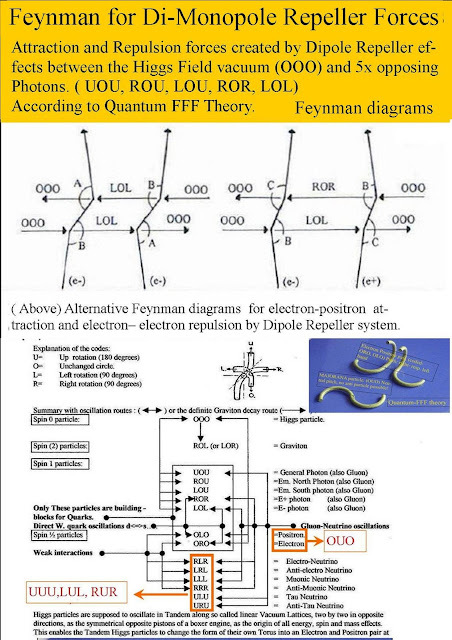 Magnetic Monopole Test to Demonstrate the Existence of a Anti Maxwell Dead Zone around a current in a wire. 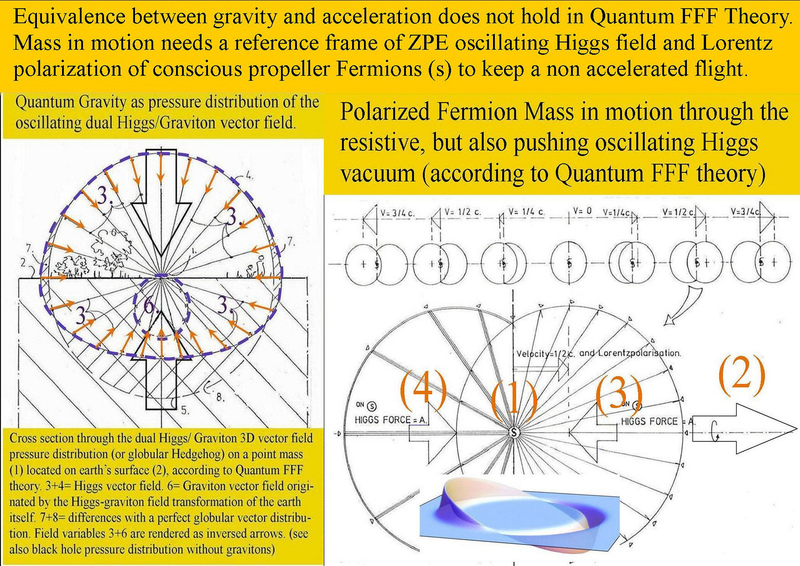 Reaction less EM Drive Thruster by Anti Maxwell Dead Zone around a Wire. 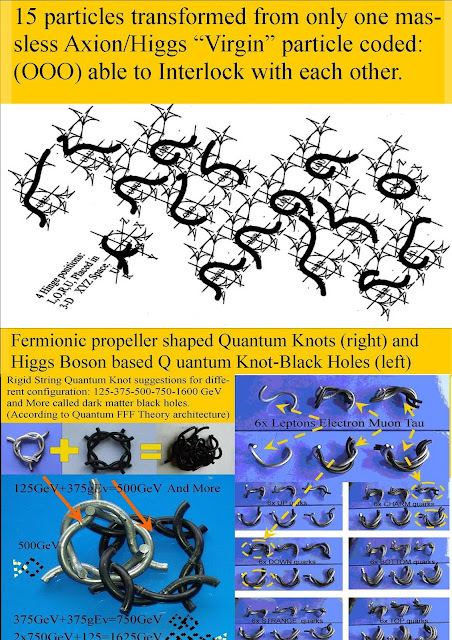 How rigid string propeller based fermions seem to spin around. Left: including distribution of monopole radiation cones. 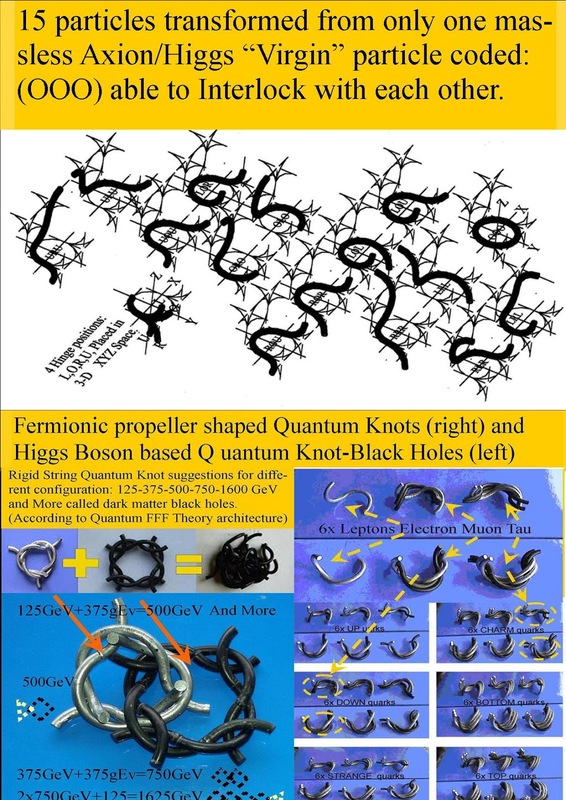 The Semi Classical Model of Quantum FFF Theory based on Symmetric Transformable Entangled Rigid Strings. 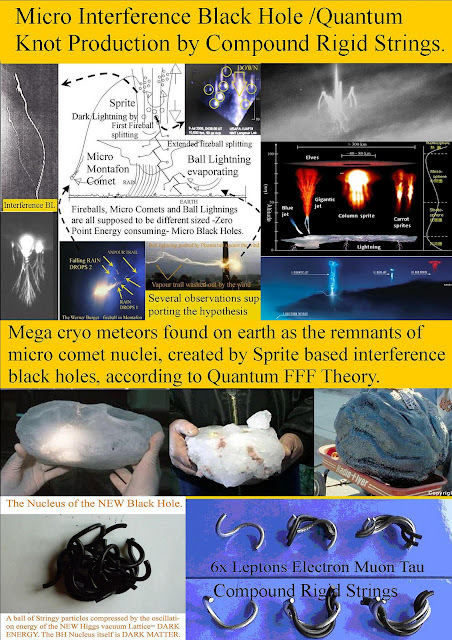 Micro black hole propulsion fir Ball lightning and Micro Comets on earth.. It is named "Dipole repeller " by prof. Yehuda Hoffmann.! According to Quantum FFF Theory, Empty space is filled with a fast oscillating lattice of massless Axion-Higgs field particles as a part of our opposing dipole pressure Axion-Higgs-graviton gravity on earth. 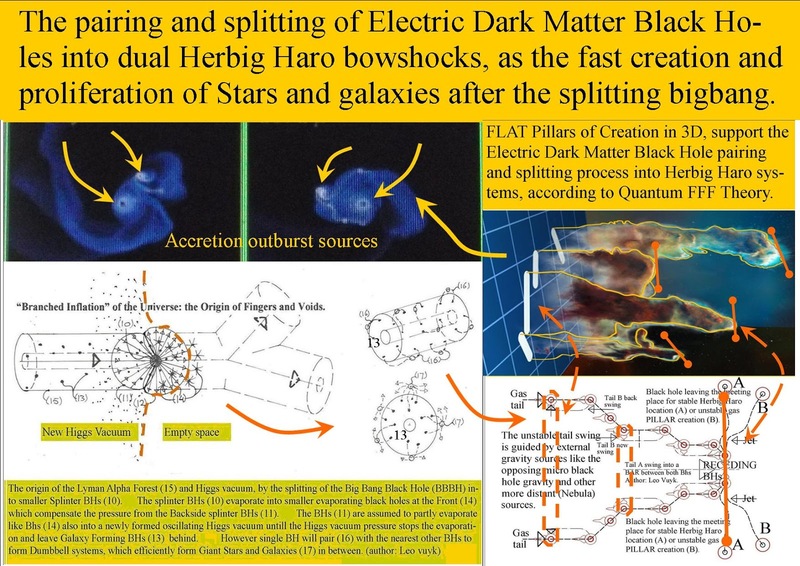 Now prof. Yehuda Hoffman shows us a support for an extra hypothesis of an extra gravity effect between dark energy overdensity push from material voids and dark matter pull from Black hole and material concentrations. 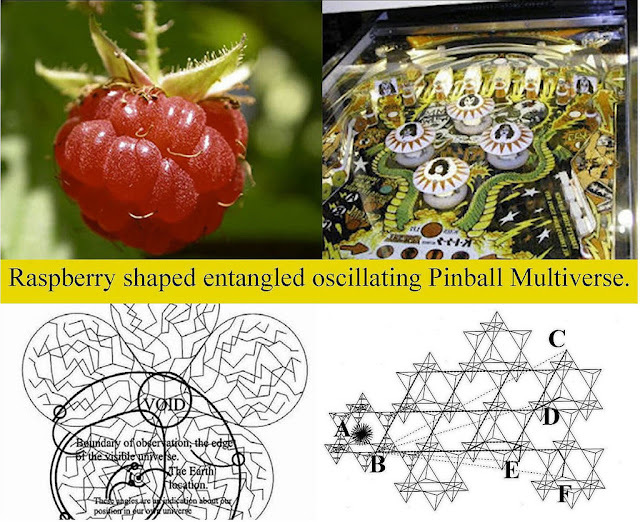 Marx generator inside electric eels and Mecong Naga dragons? 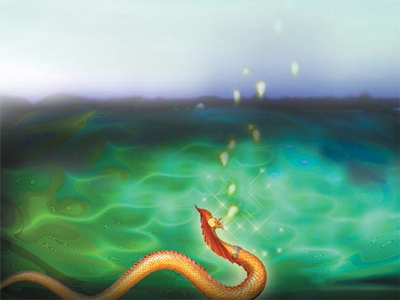 3x or 4x Marx generators inside electric eels and Mecong Naga fireball dragons? 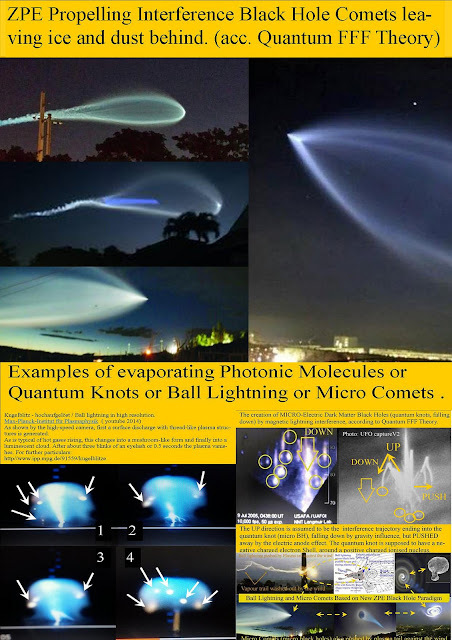 to form evaporating Higgs quantum knots or micro black holes..
Sprite-Fireballs and Sunspots according to Quantum FFF theory. 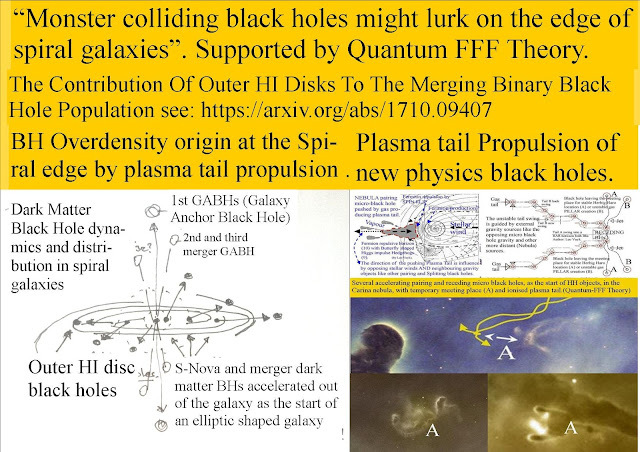 Tabby Star’s support for New Pysics Starspot Black Holes of Quantum FFF Theory. According to Quantum FFF Theory, Sunspots and Starspots in general are originated by former Comet nuclei crashed into the sun (or stars) which should be interpreted as new physics black holes. 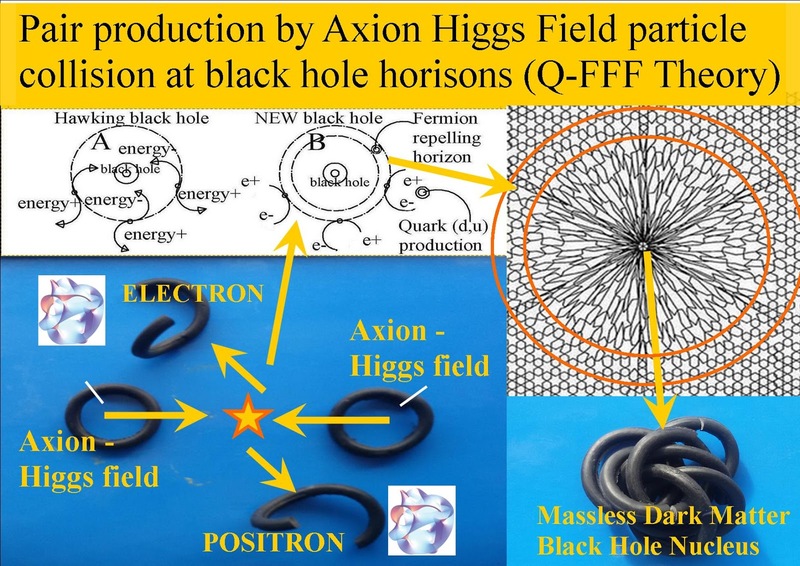 Those black holes seem to be able repel Fermionic matter but absorb the Axion Higgs field vacuum, which is the origin of a constant nuclear black hole growing ins size, but not in mass effect. 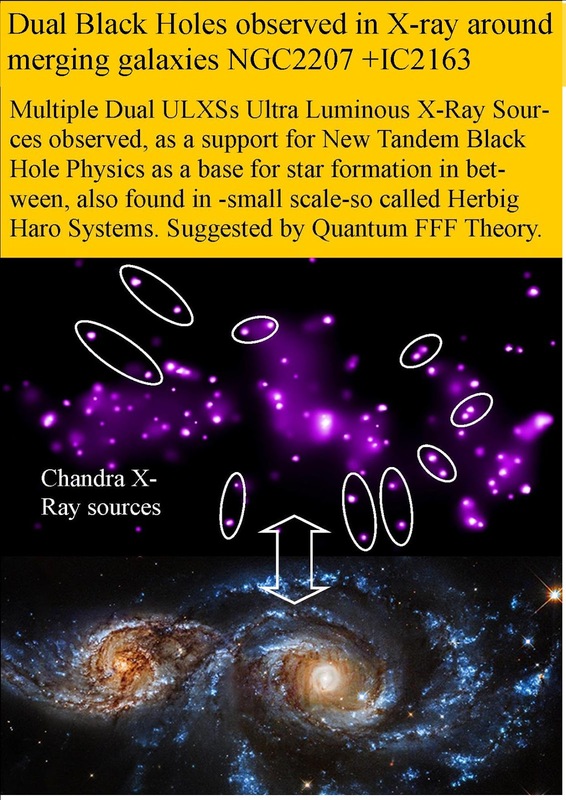 Tabby’s star seems to be a star being preparing for super nova explosion by the over density of starspot black hole populations, just as is observed in super novas such as the Helix nebula, showing rings of point like hotspots interpreted as former starspots, expelled from the nucleus. 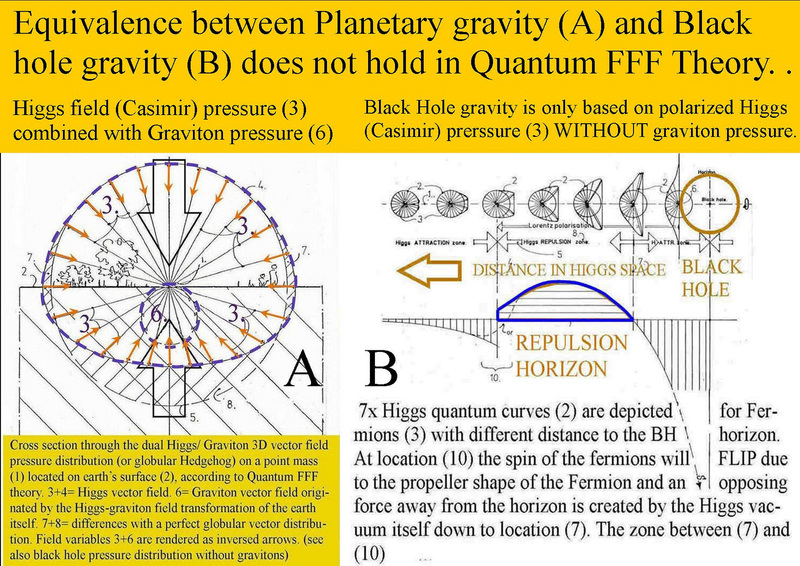 As a consequence, in Quantum FFF Theory ( Function Follows Form) all black holes should deviate strongly from the black holes as proposed by the physics community and could be coined “electric dark matter black holes” with an external negative charge without graviton radiation or even real mass- and inertia effects. The Massless Axion-Higgs Vacuum Rigid String particle, is the transformer into all other particles (Bosons, Fermions) and even concentrated in Micro and Macro Dark Matter Black Hole Nuclei. Q-FFF Theory, is basically a classical theory based on transformable rigid string based building blocks of a raspberry shaped clockwork multiverse, however these building blocks are all instantly guided by long distance entanglement between CP symmetric copy universal bubbles. Those particles are supposed to be based on only one original transformable ring shaped massless virgin particle called the Axion/Higgs vacuum and black hole particle assumed to be the product of the symmetric cyclic cold big bang black hole nucleus as the creator of only one symmetrical raspberry shaped multiverse equipped with an even number of material and anti material universal bubbles. 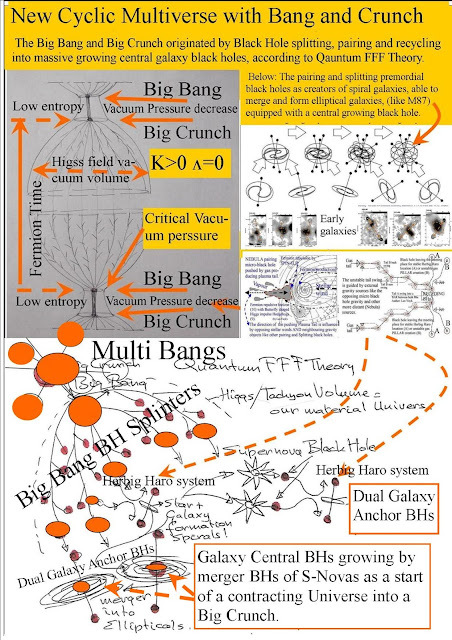 The sheer simplicity of such a system is perhaps the reason that I could not find comparable proposals for theories of everything. 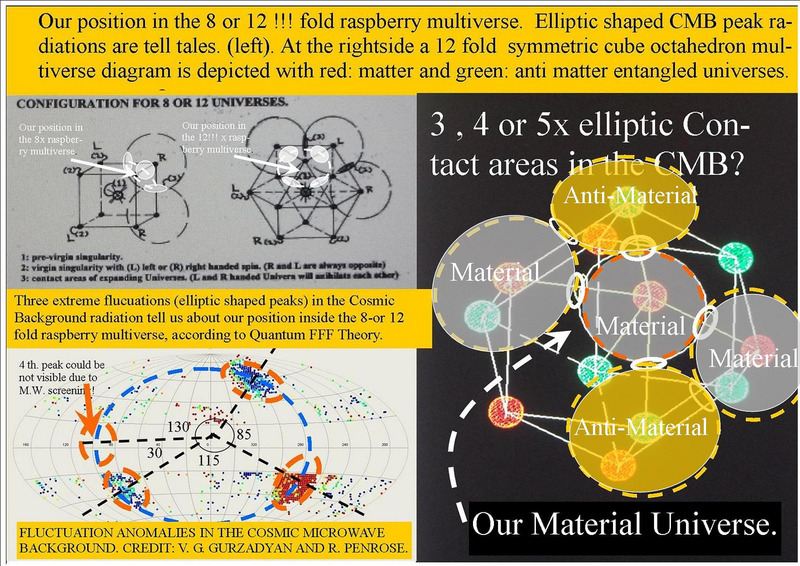 A Clockwork but instant Entangled CP Symmetric Multiverse. 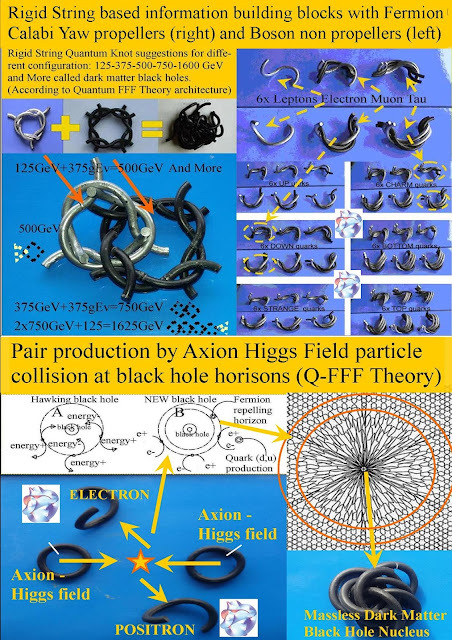 The Massless Axion-Higgs Vacuum Rigid String particle, is the transformer into all other particles and even concentrated in Micro and Macro Dark Matter Black Hole Nuclei. 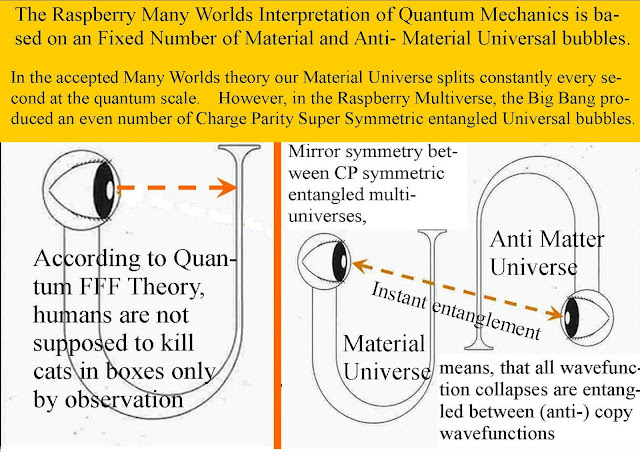 Quantum FFF Theory is basically a classical theory based on transformable rigid string based building blocks of a raspberry shaped clockwork multiverse, however these building blocks are all instantly guided by long distance entanglement between CP symmetric copy universal bubbles. 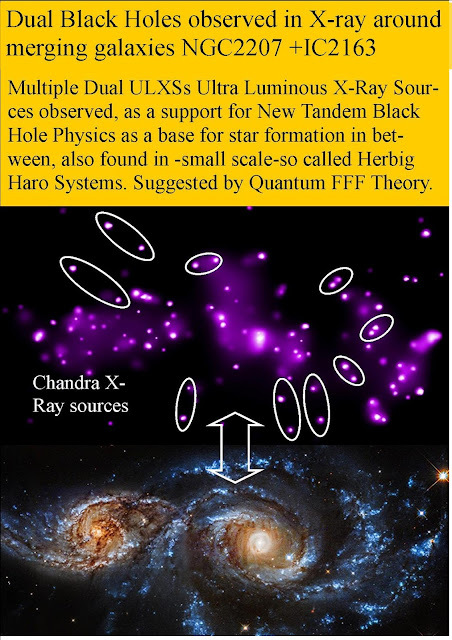 According to Quantum FFF Theory, early galaxies are created by equal massive tandem black hole splinters expelled out of the big bang black hole nucleus. 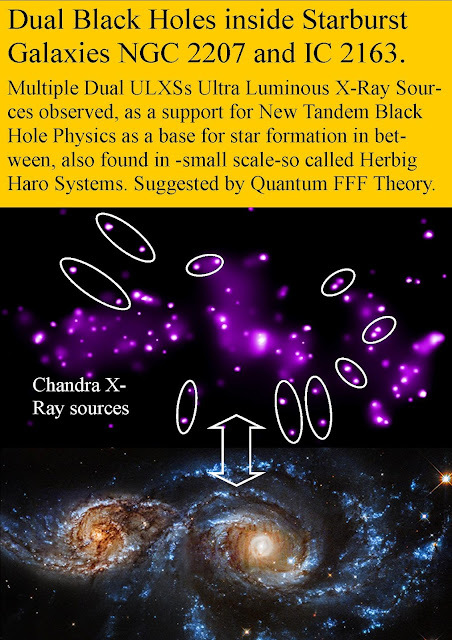 Dwarf galaxies are assumed to follow the same principle outside host galaxies between dual tandem Galaxy Anchor Black Holes. 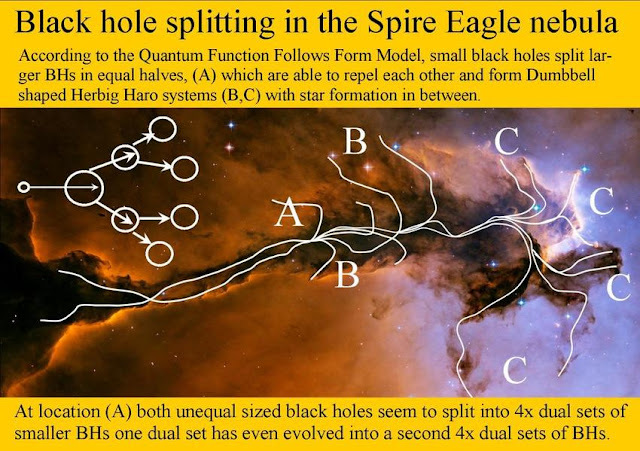 However to create equal massive BHs, I assume that the same process could be in action as observed in the Eagle (Spire) nebula. see below. 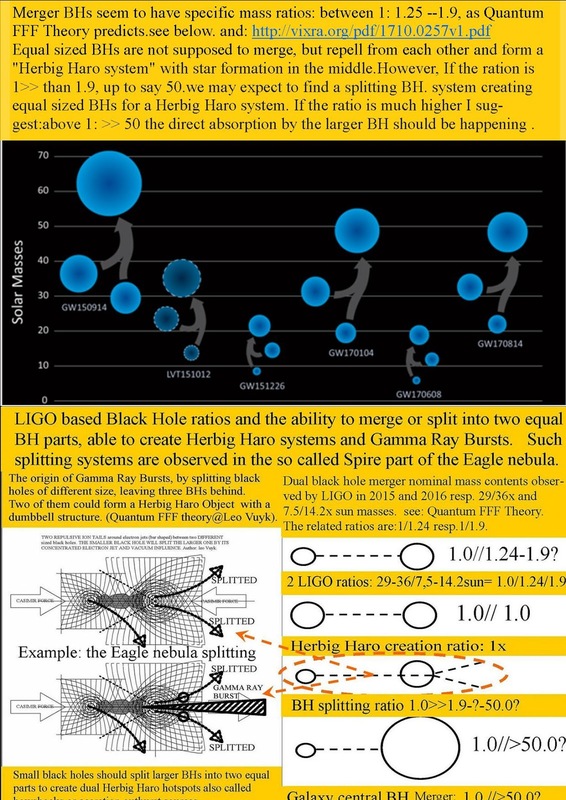 The LIGO observatory should be able to observe small BH splitting in nearby nebula as observed in the Eagle nebula. The Self Organizing Universe in three different Nebula systems. Model for the merging and splitting black hole systems. 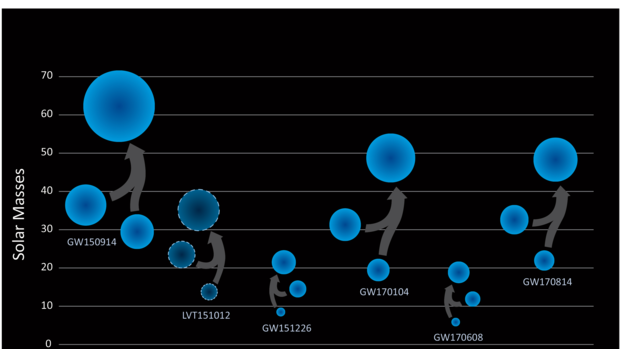 "We’ve found a bunch of dwarf galaxies we thought didn’t exist." 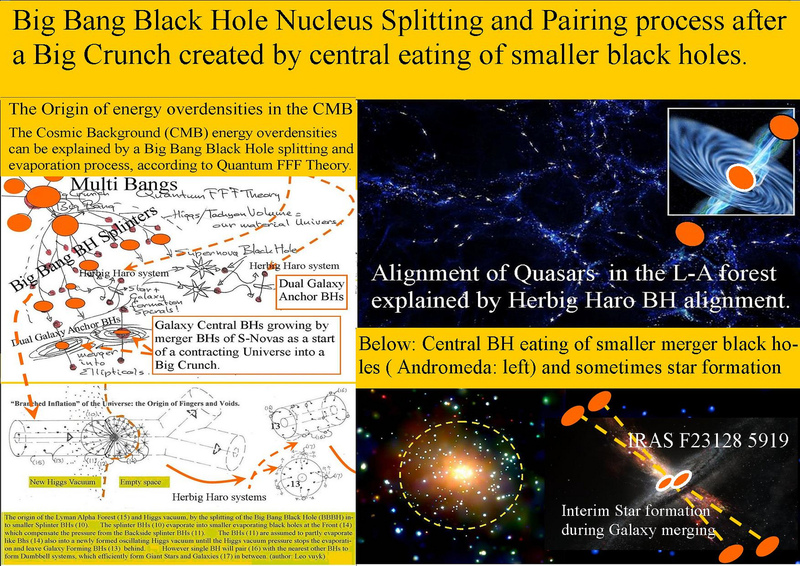 Examples how dual black hole systems seem to couple into pairs of equal sized BHs to form stars and later (dwarf) galaxies in between. As a consequence of dual equal massive black holes as observed here, I suggest that the duality was created by the splitting of one larger BH by one minor BH. as observe in the Eagle nebula at a much smaller scale. The Simple Semi Classical Theory of Everything. Quantum FFF Theory is a semi classical theory because it describes reality by the real collision and transformation processes of real but different shaped symmetric sub quantum rigid stringy particles. These particles are supposed to be based on only one original transformable ring shaped massless virgin particle called the Axion/Higgs particle assumed to be the product of the symmetric cyclic big bang nucleus as the creation of a limited symmetrical multiverse equipped with an even number of material and anti material universal bubbles. 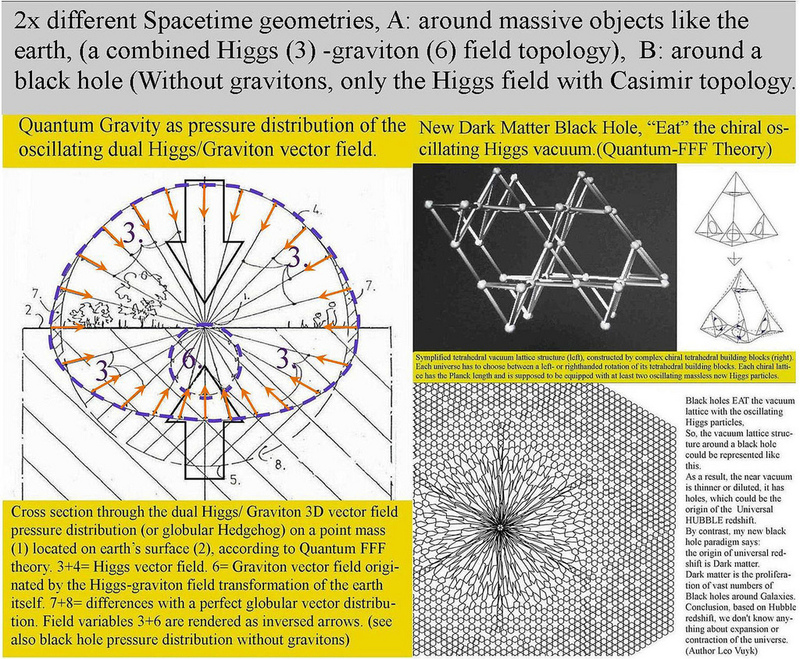 The Q-FFF theory is called Semi classical because in addition to the ring shaped transformable rigid string particles, all universal bubbles are assumed to be each others Charge Parity mirror symmetric universal bubbles which are assumed to be instant entangled down to each individual string particle created out of the Axion Higgs splitting cold Big Bang. Conclusion: each lightning stroke has a leading (evaporating, Higgs based) ball lightning black hole, created by magnetic monopole interference . see Quantum FFF Theory. "Interference Black Holes, Photonic molecules, Ball Lightning, Micro Comets, Sprite-Fireballs and Sunspots according to Quantum FFF theory." 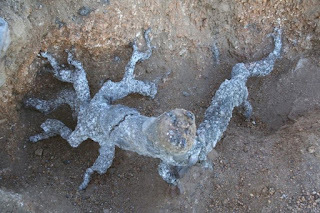 Lightning black hole leader tip effect after hitting silicon soil. 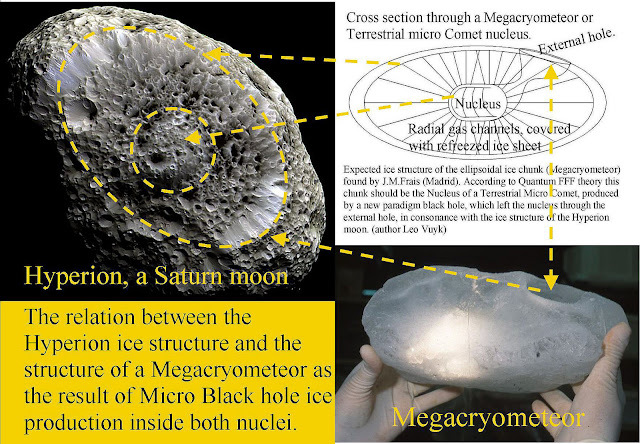 The micro black hole has splitted and evaporated leaving a burned molten silicon crust behind. 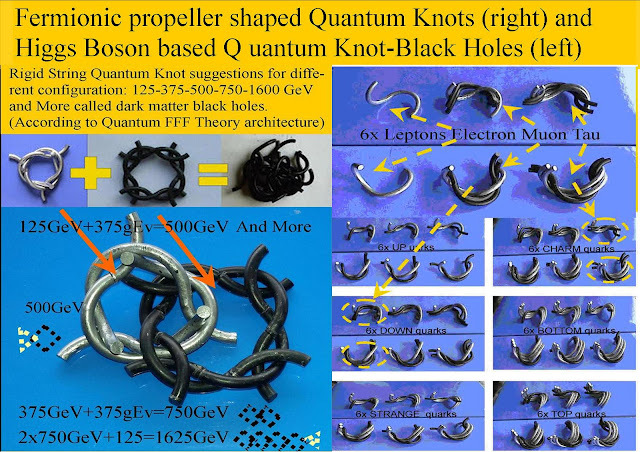 An other example of evaporating ( decaying) Quantum Knot black hole. inside a silicon drop of 12 mm. 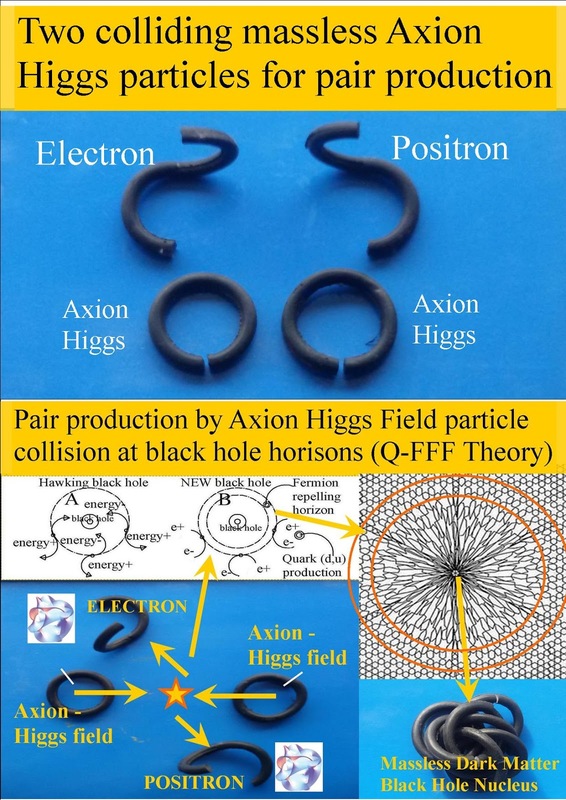 Higgs particle based micro black hole creation by èlectro magnetic interference knots. 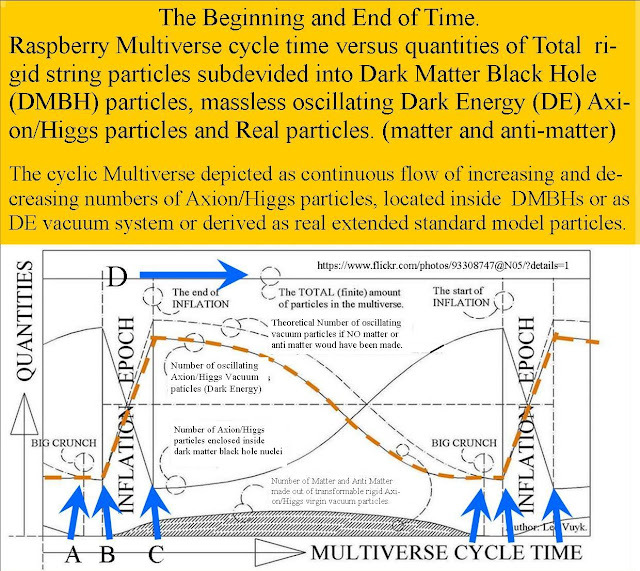 The Raspberry Shaped Multiverse, Pulsating Between Big Crunch and Big Bang. 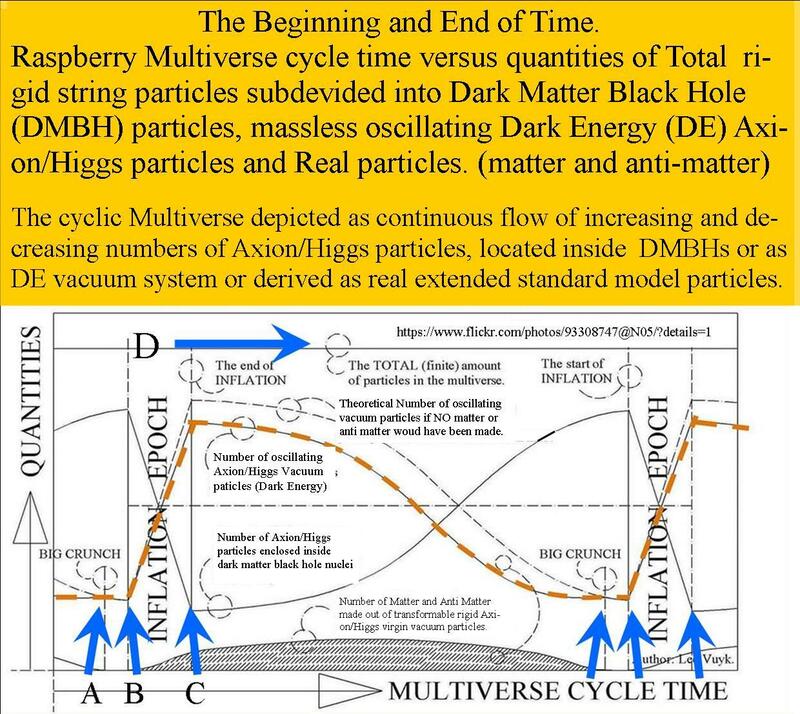 The Raspberry Shaped Multiverse, Pulsating Between Big Crunch and Big Bang, Based on Rigid Transformable massless Axion Higgs particles. 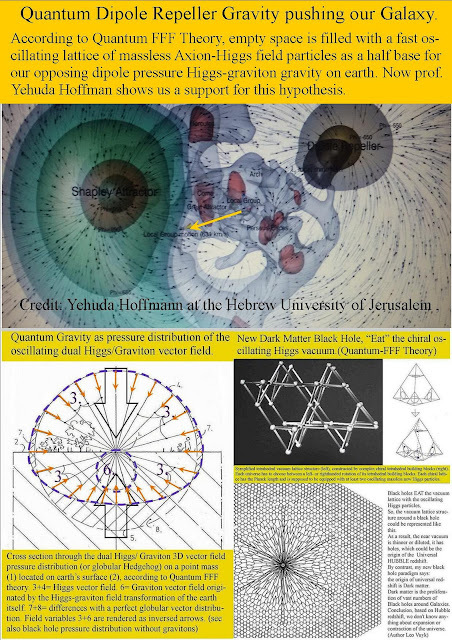 In particle physics it is an interesting challenge to postulate that the rigid FORM and topological structure of elementary particles is the origin of different FUNCTIONS of rigid transformable string particles. as a base for unstable microscopic dark matter black hole (DMBH) nuclei (for Ball Lightning as interference Higgs knots) up to stable (Sunspot and S-Nova) black hole nuclei merging into a cyclic Big Crunch/ Big Bang nucleus. 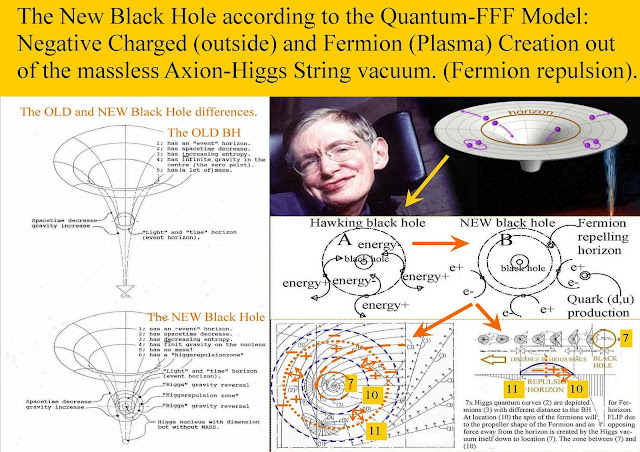 Dark Energy of the vacuum is assume to be created by an oscillating massless springy stringy Axion/Higgs field virgin vacuum particle, being one half of a new emerging quantum gravity system combine with the opposing pressure of a pushing graviton. The vacuum particles are assumed to oscillate in tandem inside spiral (chiral) flux tubes between photon communication nodes with a variable Planck length as a base, creating a tetrahedron based chiral vacuum lattice connected by nodes between two tetrahedrons. As a result, the dark matter black hole Big Bang was the cold explosion into dark matter black hole splinter chunks evaporating into the oscillating Axion/ Higgs field and series of smaller chunks, leaving a trail of Hydrogen creating stable black holes behind, also called the Lyman Alpha forest. So, the new extended standard model is based on different geometrical string structures for Higgs based dark matter black holes but also extended with a monopole photon/ Gluon system. 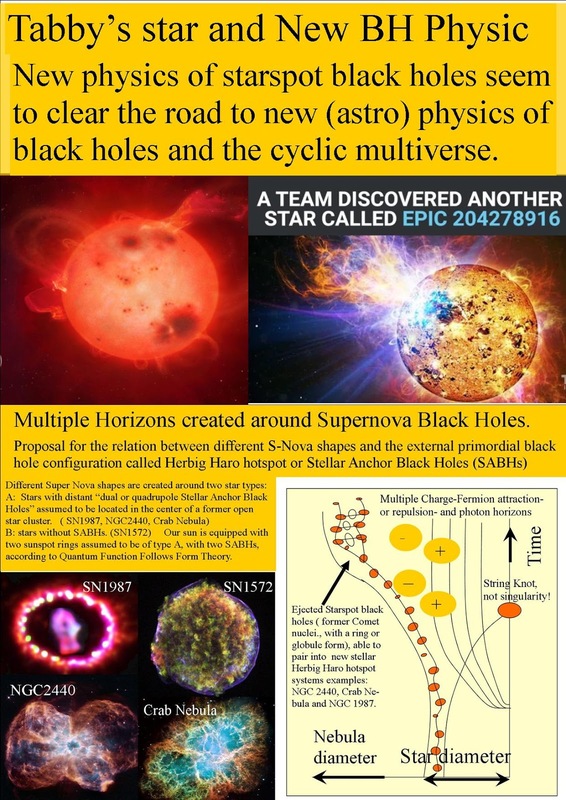 2 Introduction. 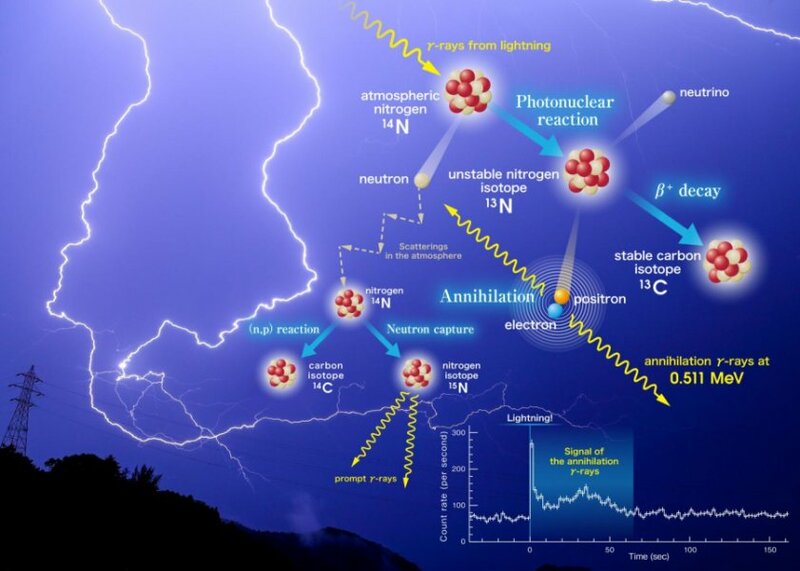 Conclusion: each lightning stroke has a leading ball lightning black hole created by magnetic monopole interference . 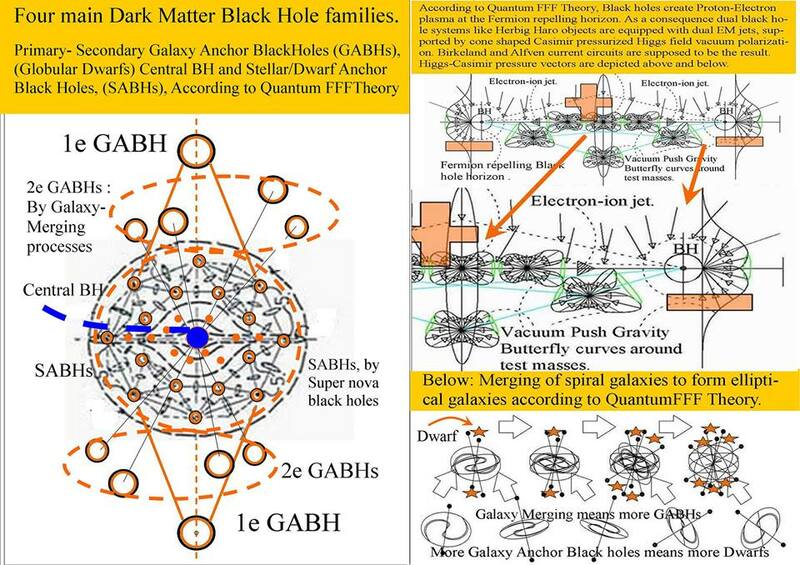 see Quantum FFF Theory. Sprite-Fireballs and Sunspots according to Quantum FFF theory." 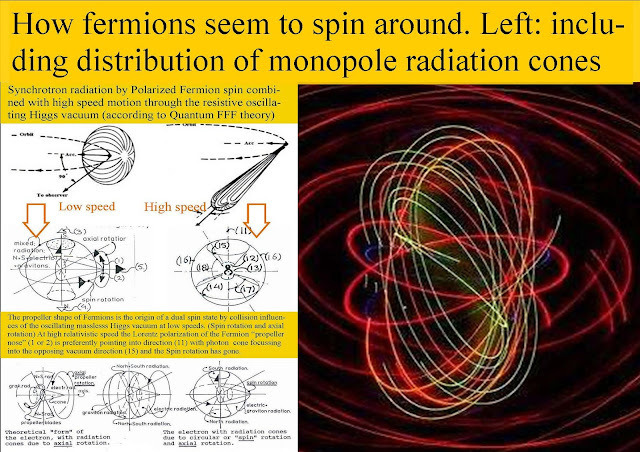 John S. Bell was Right: “How to Teach Special Relativity” and atomic pear shaped contraction. "Rigid Stringy Big Bang without a singularity "
"This new cosmological model does away with such singularity." The transformable rigid string sub quantum particles to shape the world. 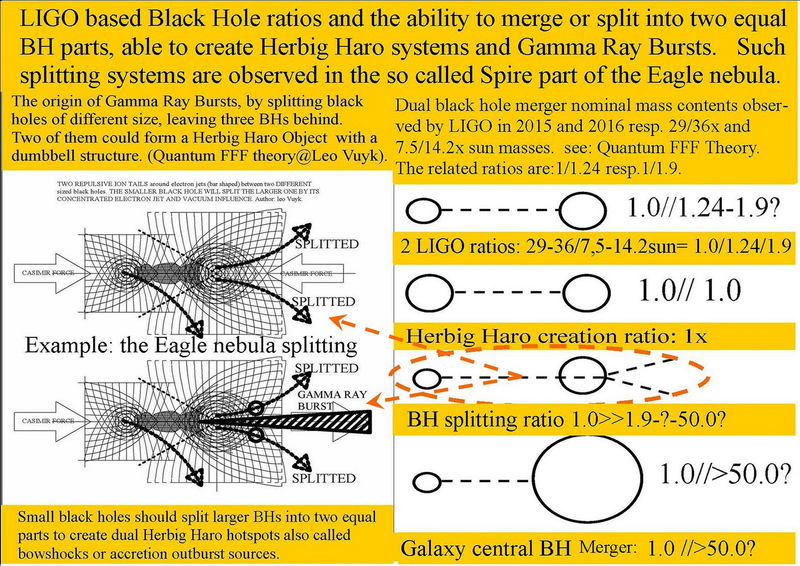 Equal sized BHs are not supposed to merge, but repell from each other and form a "Herbig Haro system" with star formation in the middle. 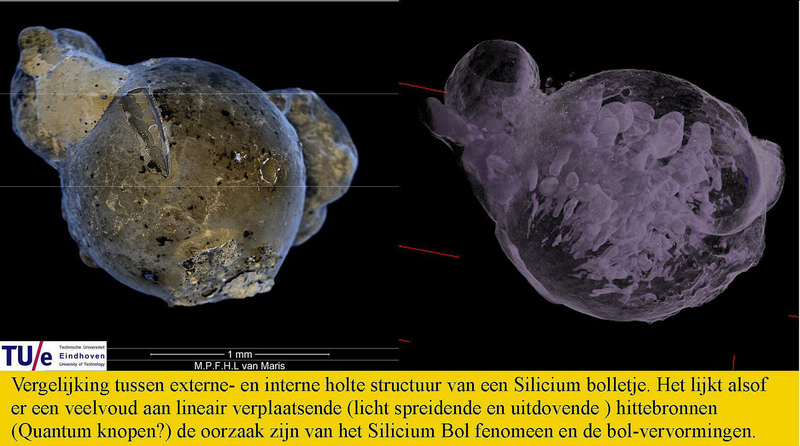 However, If the ration is 1>> than 1.9, up to say 50.we may expect to find a splitting BH. 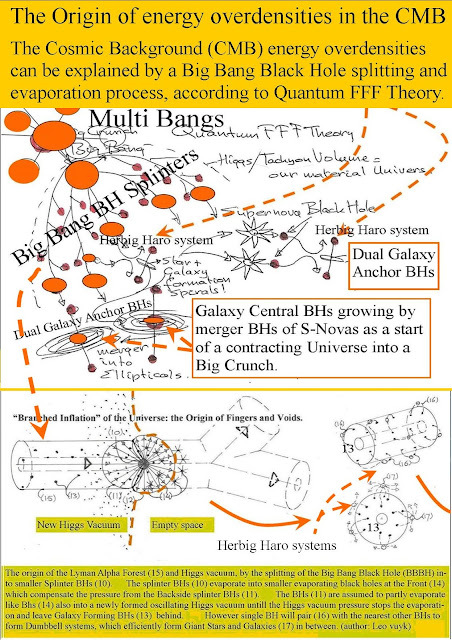 system creating a Herbig Haro system.